Historix ® is our registered heritage brand consisting of luminaires which combine the latest lighting technologies with timeless classic designs. Our heritage brand is made up of collections, within each of these are a number of luminaires of similar style, many of these styles are available in various sizes, outputs and mounting types. As a result, these luminaires lend themselves to a broad range of varied projects. Historix luminaires create dramatic aesthetics whilst also delivering impressive and functional lumen performances. These products are desirable in classical settings such as listed buildings and places of worship; as well as historic theatres and schools. All of the products within these ranges adopt state of the art technology within a traditional enclosures. Resultantly, most of the interior collections are available with integral emergency options and are compatible with advanced and varied energy saving technical controls including MIC® (Manual Intelligent Control) and dimming. 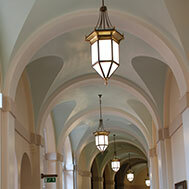 To find out more about how the prestigious University of Birmingham utilised Historix lanterns in their Ashton Webb Building click here.